ExpressVPN is one of the largest VPN providers in the world. The company is based in the British Virgin Island and was founded in 2009. 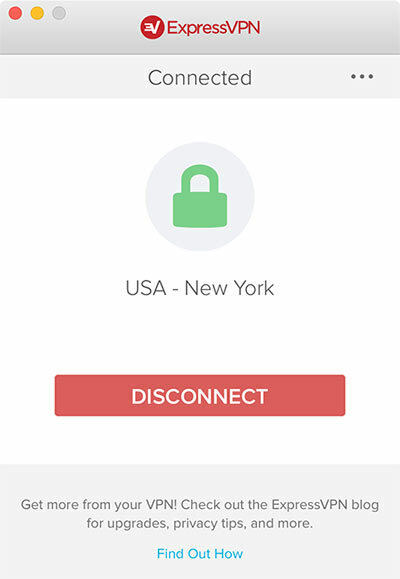 In this VPN review, we will cover ExpressVPN’s features, server locations, security, price, connection speed and customer support etc. ExpressVPN has hundreds of servers across the globe in 78 countries, including Untied States, Canada, Argentina, Brazil, Chile, Colombia, Mexico, Australia, New Zealand, Hong Kong, Indonesia, Japan, Malaysia, Singapore, South Korea, Thailand, United Kingdom, Germany, Belgium, Denmark, France, Hungary, Ireland, Italy, Luxembourg, Netherlands, Norway, Portugal, Romania, Russia, Spain, Switzerland, Ukraine, Egypt, Turkey, South Africa and many more. ExpressVPN supports the following VPN protocols: OpenVPN (TCP, UDP), L2TP/IPsec, SSTP and PPTP. As a company based in the British Virgin Island, ExpressVPN doesn’t fall under the U.S. Data Retention or the EU DRD laws, which makes ExpressVPN a good choice if privacy is a top concern for using VPN. ExpressVPN is a logless VPN. It doesn’t keep VPN user’s activity logs or session data. In addition, ExpressVPN accepts Bitcoin as a payment option, which provides further privacy protection for paid users. ExpressVPN does not limit bandwidth. Also, it allows unlimited server switching. ExpressVPN does allow Torrent and other file sharing traffic from all of its servers (many VPN providers don’t allow those kind of traffic). For simultaneous connections, ExpressVPN allows up to 1 computer, 1 mobile device (tablet or smartphone) and 1 streaming media console (i.e., Apple TV or Xbox) to be connected at a time per subscription. There’re two ways to bypass this limit: 1) Set up ExpressVPN on a supported router (DD-WRT, Tomato etc.) so that all connected devices can share the VPN. 2) Connect ExpressVPN on a Mac or Windows computer and then set up Internet sharing on that computer to allow more devices to share the same VPN connection. ExpressVPN offers three types of payment plans: $8.32 per month if paid annually, $9.99/mo if paid per 6 months and $12.95 per month if go with month-to-month. ExpressVPN offers a 30-day money back guarantee for users to test out their VPN service. While many VPN providers only provide 3 or 7 day trials, ExpressVPN’s 30-day money back guarantee is indeed a very generous offer. ExpressVPN provides free VPN software for the following operating systems: Windows, MacOS, Linux, iOS and Android. In addition, its VPN can be set up manually on the following operating systems: Windows, Mac, iOS, Android, Windows Phone, Linux, Chromebook, ebook readers, streaming media consoles (Apple TV, PlayStation, XBox, Chromecast, Roku, Amazon Fire TV, WD TV Boxee Box etc.) and supported routers. 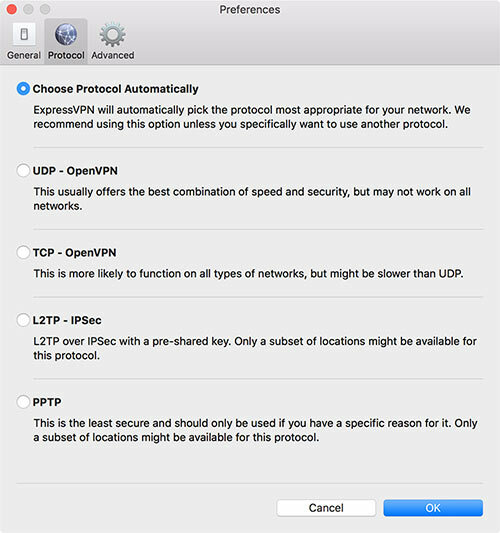 This software allows users to choose different VPN protocols (PPTP, L2TP/IPsec, OpenVPN and SSTP) as well as switch server locations. When you open up the location picker, you will see a large number of locations around the world that can be connected to. VPN connection can be turned on or off by clicking the Connect/Disconnect button in the middle of the software. We found ExpressVPN’s software is very clean and very easy to use. Ping: 15 ms, Download: 71.98 Mb/s, Upload: 11.73 Mb/s. Ping: 13 ms, Download: 41.20 Mb/s, Upload: 9.62 Mb/s. Ping: 95 ms, Download: 42.88 Mb/s, Upload: 9.54 Mb/s. Ping: 51 ms, Download: 49.90 Mb/s, Upload: 9.76 Mb/s. Ping: 97 ms, Download: 27.44 Mb/s, Upload: 8.98 Mb/s. Ping: 274 ms, Download: 25.92 Mb/s, Upload: 5.74 Mb/s. Ping: 253 ms, Download: 22.48 Mb/s, Upload: 3.61 Mb/s. ExpressVPN speed test conclusion: ExpressVPN connection speed is very good across different server locations. ExpressVPN really shines in terms of customer support. On ExpressVPN’s website, a small chat windows is visible. Visitors or existing users can use the live chat window to talk to a ExpressVPN customer support representative directly. We tested ExpressVPN’s customer support in a number of occasions using live Chat. Every time we were able to get connected to a support person in less than a minute. In terms of problem solving skills, we were very impressed by the knowledge and patience of ExpressVPN’s customer support team. Every time we had a problem or question, we were able to get it solved or answered. As a matter of fact, we think ExpressVPN’s customer support team should definitely be given a 5-star rating. 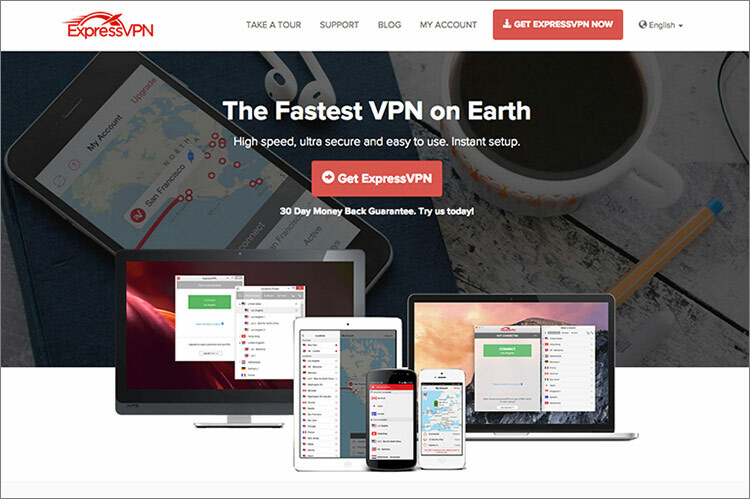 As one of the largest VPN providers, ExpressVPN provides stable VPN connections, fast speed, multiple worldwide server locations and easy to use software. Their customer support team is really helpful. Based on our test, we recommend ExpressVPN to our readers and have ExpressVPN in our list of the Best VPNs.